Liguria is one of the most beautiful coastlines of Europe. In particular the Riviera di Ponente with the famous spots like San Remo or Alassio has got a lot to offer. Very mild climatic conditions throughout the whole year. To find similar conditions, especially in winter, you must go further south than Napels. An incredible indeciduous vegetation with a wide range of flower that mix perfectly with the typical olive groves. A big part of Europe's cut flowers are being grown here. Hundreds of beaches and bays which are empty and quiet in winter and filled with tipical italian beach life in summer. An upcoming region with ambitious projects: with european subsidies a number of projects are being carried out that will make the Ponente even more attractive. Some yacht harbours, the most important of them directly in Imperia, golf courses and europas longest biketrail along the coast. Its perfect position between Genoa and the Cinqueterre at the one, Monaco and the Cote d´Azur at the other side. For good reasons we have specialized in property in the Valprino Valley in and arround Dolcedo: Dolcedo is a very special place in the hinterland of the Italian Riviera due to it´s marvelous old architecture: Many of the old olive mills had been restored over the last years, the olive oil is still a major source of income in the region. And thanks to the wonderful position along the river Prino with the many medival stone bridges that curls down the mountain. Dolcedo lies about 7 km from Imperia an has about 1500 inhabitants. The particularities of the village is the mix of nativeness and the modern spirit: there is still a working sozial life among the native inhabitants, on the other hand there are tourists and 2nd house owners from all over the world. Dolcedo has a good infrastucture with shopping facilities and several restaurants ranging from simple Pizerria to haute cuisine. The Valprino valley is a very charming and relatively unspoilt area. It is the valley of the olives, here grows the Taggiasca olive that makes one of the world´s most famous oil. Its silvery glancing indeciduous leaves give the landscape its caracteristic look. The valley at the Riviera of flowers is varied and has a lot to offer: lonely hiking and mountainbike trails in the mountains, a variety of very original little villages like Ripalta, Isolalunga, Bellissimi, Lecchiore, Vasia, Pantasina, Pianavia, Valloria, Molini di Prela, and benefits from beeing close to the capital Imperia. Imperia is a very lively italian town-even in winter .It offers numerous bays and beaches, diverse touristic features, some cultur, a picturesque Old town on the valleys of Porto Maurizio, shopping facilities, and many restaurants. 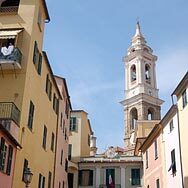 The eastern part, Oneglia with its commercial harbour, oil and pasta industry and shopping malls is the modern part. The old part Porto Maurizio with the marina in the west is a maze of tiny streets just like the close San Remo, but there are- just as impressive- monumental buildings as well. The river Impero, eponym for the town, seperates the two parts. Imperia is rapidly remodelling its impression by the building of one of the biggest marinas along the Italian cost. This huge project will be finished by 2010. Apart from the marina with yachtclub and all most modern facilities a new shopping and culture center, new public parks, and a new museum are being buildt. This all will rise both the attractivity of the city and the request for property. 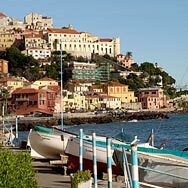 The surrounding area has a lot to offer as well: mediterranean flair with charming villages along the coast, valleys with idyllic cottages in the hinteland invite to a day´s tour- like Alassio and San Remo. The distance to the french border and the Cote d´Azur is only 50 km, the Airports of Nizza and Genova are only 100 km apart.